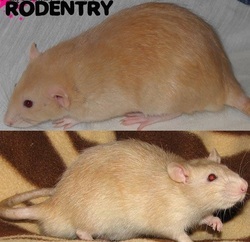 **NOTE: Every color has a variety of shades that it comes in so not all colors are EXACTLY what every rat of that color should look like. Also, remember that lighting, cameras, monitors and many other factors can slightly alter colors but I represented these colors as best I could. Thanks for looking! 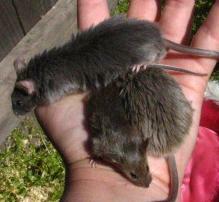 This is a picture showing the difference between a dumbo and standard eared baby rat. 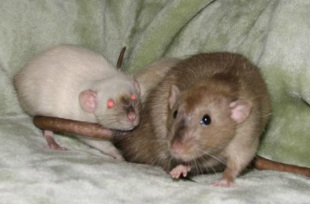 The standard is on the left and the dumbo is on the right. Notice that even at a few days old the standards ears are closer together and pointed slightly upward where the dumbo's are lower set and point slightly out. To find a full description of these colors Go to one of these links. 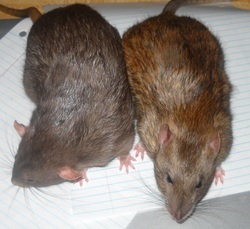 The chocolate is on the left and the agouti is on the right. 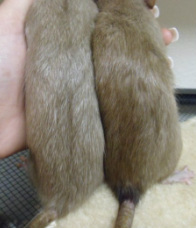 The chocolate is a deeper darker brown and the color should be even throughout(this male has too much silvering and uneven coloring). 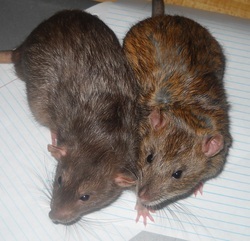 The agouti has a mix of brown/red, tan and black hairs. Agouti should appear more rich and "ticked" looking. -both pictures were taken with flash. 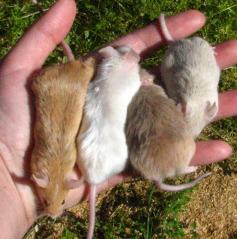 Left to right: Recessive Yellow, White(satin), Beige and Ivory - picture taken in natural sun light. 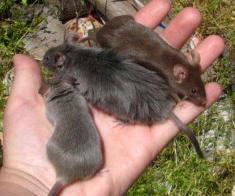 Dove on the left, blue in the middle, chocolate on the right. - picture taken in natural sun light. 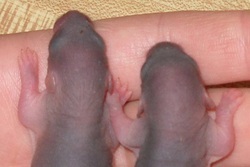 Blue on top, Agouti on the left and Dove on the right. The dove is angora so her color is a little dark. - picture taken in natural sun light.